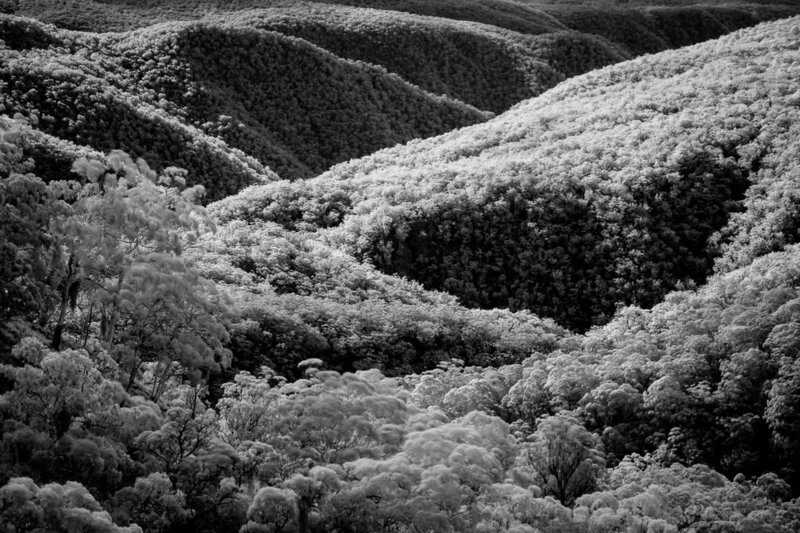 Many people don’t think of Australia as mountainous, yet the Great Dividing Range is the third longest mountain range in the world at 3,500km. This pretty much runs down the eastern length of the country and includes Australia’s highest mountain, Mount Kosciuszko which is 2,228m. I live in Yamba on the New South Wales coast. It sits on the mouth of the Clarence River, one of the largest rivers in Australia. Its headwater is on the eastern slopes of the Northern Tablelands (or New England Tablelands) which form part of the longer Great Dividing Range as it passes through NSW. The great thing is that I can get there in 2-3 hours. Where I am I enjoy the the best of both worlds - living on the coast, but with mountains and something wilder not too far away from me, especially considering the vast geography of Australia. Nonetheless, a 4-6 hour roundtrip is not to be sniffed at and uses up a $60 tank of petrol and about $20 of munchies. When I visit I tend to camp overnight to make the most of my time and the journey, allowing myself to explore longer and further, and to increase my chances of good light. I particularly love having a night or two away camping with the camera. It truly feels like getting away from it all, I can just forget about everything and become fully immersed in the landscape and my photography. Blissful, but adventurous. I’ve been to the closer parts of the Tablelands a few times, but a couple of weeks ago I headed further south to the area around New England National Park for a short recce trip ahead of a longer trip in Autumn. The New England NP sits on the ‘Waterfall Way’, a road that travels from Coffs Harbour, on the east coast, inland over the mountains to Armadale. Though called the Waterfall Way, it wasn’t the waterfalls so much as the wild and expansive mountains that I was wanting to explore. If you want to take a look at the area the NSW National Parks and Wildlife Service (NPWS) do really good visitor guides for the National Parks (download the PDF here). After a 3 hour and, towards the end, very windy drive I arrived in Ebor atop the wide mountain plateau. It's quite strange up here. At 1,300m elevation Ebor is a good deal higher than any of Scotland’s mountains. Yet the terrain is rather flat - perhaps unsurprising given that it’s a plateau! With gentle undulations and wide grassy expanses, this is cattle country. Not exactly what you expect to find at the top of a mountain. It's also quite temperate. Down on the coast the temperatures are close to 30C. Up here I don’t recall it reaching 20C and the nights were a wee bit chilly. It even snows! More my natural environment really. Ebor is known for a series of rather stunning waterfalls, where the Guy Fawkes River plunges off the plateau and over the escarpment edge. Beyond, the river winds through the gorges of the Guy Fawkes River National Park. It is these escarpments and gorges that make the area particularly beautiful. I’ve yet to find out why the river is named after my ancestor, but it gives me a strangely warming feeling being so far from home. As does Armidale the ‘original’ (well, it's actually spelt Arm-A-dale) being on the southwest tip of the Isle of Skye, close to my more recent ancestors' old croft. There are two lookouts close to the car park, which is only just off the main road, offering good views of the waterfalls. A path following the escarpment edge links the two. Having reviewed dozens of images in my research of worthwhile places to visit in the area, I was feeling pretty downhearted at how similar they all looked. 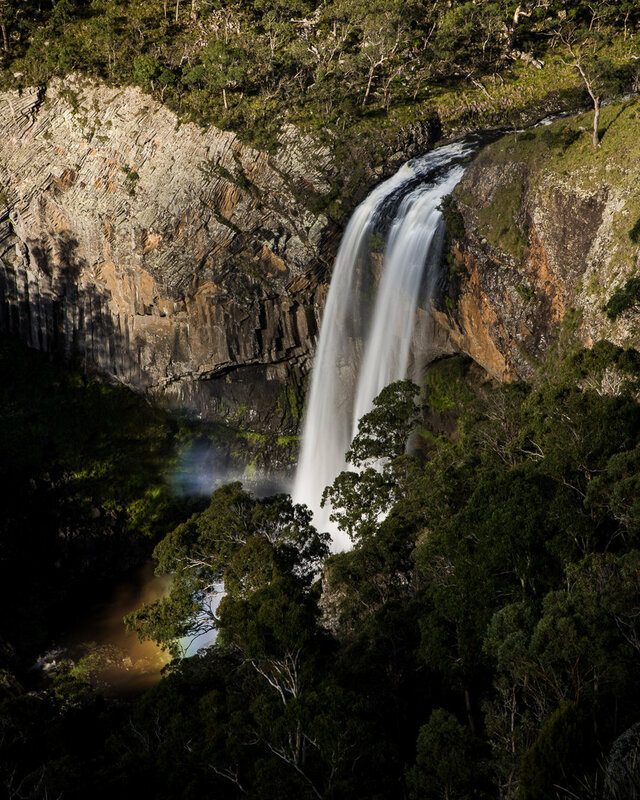 With limited clear views of the falls, almost all of the photographs that you see of Ebor Falls, Upper or Lower, are taken from one of these lookouts and so offer limited potential for something different. I've never been a big fan of such photography, feeling a need to have more than lucky environmental conditions to make a noteworthy photograph. However I did spot one photograph made from below the falls. This gave me renewed hope that there was more potential than the many other photographs suggested. Having taken the obvious shots at the top, I determined to find my way down the escarpment. I’m not going to share the story or the route here, but it was a bit hairy scary at points. When I bashed my leg on a rock, I recalled the accident my friend Doug Chinnery had in a river in Glen Coe when he badly broke his leg leaving him immobile for months. Or David duChemin falling from that wall in Pisa. Nobody would even know I was down here, nor would they hear my cries above the roar of the waterfalls if something did happen. At once I felt a bit stupid. I know that sounds melodramatic, and in reality it probably wasn’t that bad. As photographers and outdoors people we are familiar with and accept some element of risk in what we do. The extent of the risk we accept is personal. Past psychological profiles have shown me, as if I didn’t know myself, to be generally risk averse. I have also always been scared of heights. Photography to a large extent cured me of that, my desire to get the shot overriding my irrational fears. My photography has helped me to develop a more intrepid side. I’ve fearlessly scrambled gorges in Wales and the Peak District, trekked moorland in thick snow with a blizzard on my shoulder, and climbed one of the highest mountains in Scotland. Each time I was prepared and comfortable with what I was doing. Sometimes though that (irrational?) risk aversion pops up and imagined stories of "The Idiot Scotsman who broke his legs climbing the cliff at Ebor Falls" splashed across the international media made me feel a bit foolish. So I hastily made a couple of shots by the edge of my namesake's river before carefully picking my way back up to higher ground. I wonder now, on reflection, if it wasn’t quite as dangerous as I thought. I wonder if I should return with better light and more time, or if my initial instincts were correct and to be trusted. I guess my next visit there will decide how bold I feel. Read more about my trip in my next blog. In the meantime, enjoy and read about a few more images below.